Das Can-in-Stein - Moar Stuff - You don't need it but you know you want it. 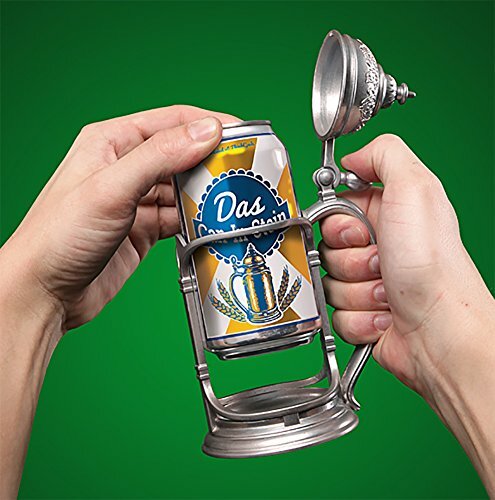 The Das Can-In-Stein Drink Holder makes it look like you're drinking from a pewter tankard! 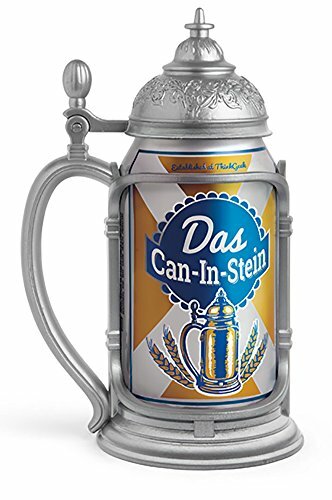 Das Can-in-Stein from ThinkGeek (via Amazon) turns your boring aluminum beer can into a pewter stein just like the ones at Oktoberfest. OK, maybe not just like a real Oktoberfest stein but, close enough for your next BBQ. Just slip your drink into your Das Can-in-Stein and brace for the impending carousing. Made from a pewter-look resin, it holds any standard 12 oz. can. The resin construction is pretty tough and doesn’t transfer heat. So, holding the handle won’t result in warm beer or cold fingers. Anyone whose ever fished a beer out of the cooler only to have their finders go numb from the cold can 10 minutes later will appreciate that. The hinged lid is operated by your thumb. It will help prevent some accidental spills if you get too excited while watching the game. It will also keep bugs out of your can when outside (a nice side-benefit). Most importantly, though. It acts as a good way to know when it’s time to stop drinking. When you no longer have the coordination to open the lid with your thumb, you’ve had enough. Besides, drinking from a stein is just classier than drinking from a can. Even your cheap-assed PBR becomes a real beer when drunk from a stein. 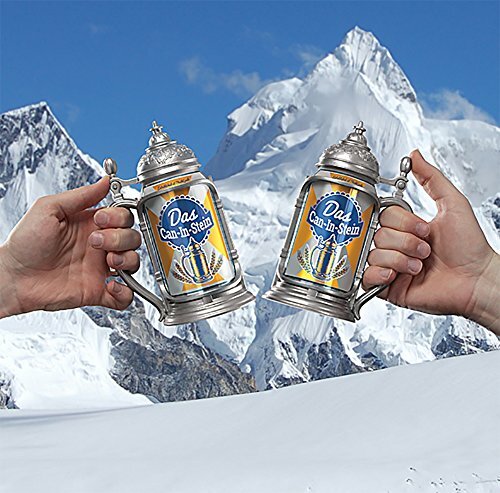 So, let the Das Can-in-Stein turn your next backyard event into Oktoberfest! Dimensions: 8 x 4 x 5 inches (20.8 x 10.4 x 12.7 cm). Holds standard 12 oz. US cans. Hinged-lid with thumb-lever easy to operate with a single hand.